As part of the ADDED VALUE project a promotional campaign was implemented to promote a newly constructed cycle path in Varna, Bulgaria. The wider campaign involved cycle training and competitions for children. More than 2 000 children directly took part in the initiative, and a further 10 000 students and adults were indirectly involved, receiving information about the benefits of cycling. Following the initiative, attitudes of participating children towards sustainable transport and cycling use changed from 37 to 59 per cent. Despite one in five Bulgarians (over 1.5 million people) owning a bicycle, few cycle day-to-day. Varna, a medium-sized port city with over 300 000 inhabitants is a largely compact city characterized by low topology and is thus ideally suited for cycling. However, despite the road network been almost 1 000km, only about 5km of cycling paths are currently available, many of them are quite narrow and parking on them is not strictly controlled. The main aim of this initiative was to target young people (and the general public) to use the cycle paths and encourage them, and equip them with the necessary skills to cycle more often. 10 schools participated, and in each school two training sessions with children aged between 7-14 years were held. The cycle trainings took place between May 2008 and April 2010 and were held in the school playground of the selected schools. 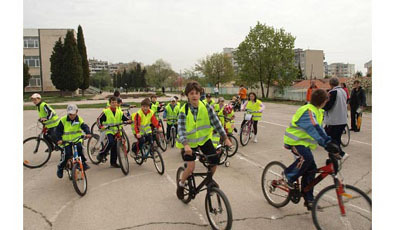 The training consisted of three parts: a short theoretical presentation on safe cycle use; practical safe cycling skills by experts from Varna cycling clubs; and supervised practical training for children in the school playgrounds which were painted as artificial streets, with traffic signals and road markings. Older children were invited to write essays on the theme of 'Cycling and sustainable mobility in the city of Varna', with the aim of getting them to think more deeply about wider sustainability issues. Students from 10 secondary schools took part in the competition, and later presented summaries of their reports. The best three essays and presentations were rewarded with small prizes. Almost 50 students participated in the essay competition, divided into 20 teams. The presentations of the thesis were attended by more than 500 students and teachers, and were judged by representatives of the Regional Inspectorate of Education, and Educational Department NGOs.